Suhana Kadoura used the following checklist to help assess each student's accomplishments at the math fair. 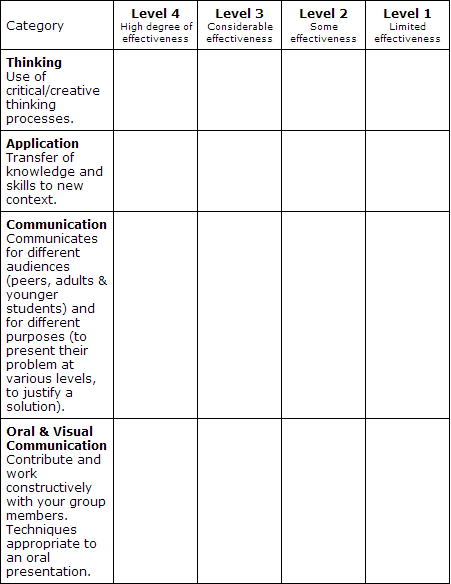 Following the checklist is a brief description that tells the students what to focus on. There is a clear connection between the checklist and the curriculum guidelines for her school district. Not shown in the checklist is the fact that she also included space at the end for her observations and comments. Problem Solving: develop, select, apply and compare a variety of problem solving strategies as you pose and solve problems, and conduct investigations, to help deepen your mathematical understanding. Communication: communicate mathematical thinking orally, visually, and in writing, using mathematical vocabulary and a variety of appropriate representations, and observing mathematical conventions. Representing: create a variety of representations of mathematical ideas, connect and compare them, and select and apply the appropriate representation to solve problems.